Sven20 wrote: Okay. I'm at SFFT it's a shot show. Broke down constantly yesterday. Today broke after 1 cycle to start day. Got back in line after first ride broke down again. Then they went to 1 train ops and that train had only 7 working seats. Of course with no srl and ops without enough iniative pull people and call out empty seats trains were going out with 5 or 6 all the time. SF parks don't have the ops to handle a ride like this. Wonder Woman has never NOT broken down exactly once when I've been in line for it, but it's also never taken more than 10 minutes to come back up. Railblazer seemed to be very reliable the one day I was there a few weeks ago. Aside from a late opening where we couldn't ride until 11am (which really isn't a big issue), I don't recall it ever breaking down the entire day. Also, despite running two trains (which I feel will be the usual), the ride really pulls through its line more than I expected it too. Every train went out with 8 riders, and there was absolutely zero stacking the vast majority of the time. 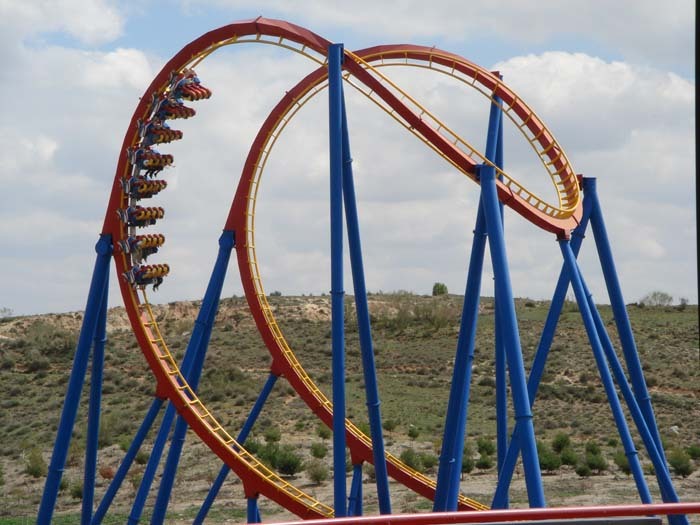 Still not a "high capacity coaster" by any means, but I think this type of ride would work fine at most amusement parks that have good operations and manageable crowds. Also, I saw on Instagram that the black/green train is now in operation. I'm not sure if it got switched out with the red or yellow one, or if they're running three trains now, but it's back. thrillseeker4552 wrote: Also, despite running two trains (which I feel will be the usual), the ride really pulls through its line more than I expected it too. Every train went out with 8 riders, and there was absolutely zero stacking the vast majority of the time. Still not a "high capacity coaster" by any means, but I think this type of ride would work fine at most amusement parks that have good operations and manageable crowds. I don't know how things were when you were there but I didn't feel like a third train would have made much difference at all. It was rarely stacking but I think I only saw once or twice where a train dispatched before the other one was hitting the brake run. Yeah, it is usually very difficult to make three trains efficient on any coaster that doesn't have a MCBR or a freakishly tall lift hill (Fury and Leviathan). That's why I said two trains works out just fine and wouldn't be much of a problem for most medium-sized parks. They would have to be SUPER fast and have the lift hill go very slowly along with a continuous loading station to make three trains worth it (see: Wonder Woman). Haven't done a trip report in a while, and finally gathered the motivation to talk about my trip to CGA on August 5th. I'd never been to California before going out to visit family earlier this month, and had an amazing time. Though I hoped to visit CGA while I was there, I didn't expect that we would, as it hadn't been brought up much prior. It was very exciting finding out that my family would be cool with going to the park, as I haven't been to a new park since I first went to Lakeside here in CO (back in 2015 I think ). I'll also note that I've been to SFGAm, so it interesting to see the other "Great America". difficulty regarding their veggie burger to the point where they got it refunded, but other food staff were pretty kind and quick. Another grip would be not getting to pick your row on most coasters, but I see why it worked for station crowding/capacity. Overall the park had a really nice, relaxed atmosphere and I had a really good time. What surprised me the most here was this ride being a walk-on. Tower of Doom, another Intamin drop tower at Elitches, always has one of the more significant waits in the park, so being able to get on immediately was great. May have something to do with capacity, as this ride was running 5/6 sides with the sixth car sitting in its spot on the platform, while Tower of Doom runs 2/3 sides and the third car hasn't been on the ride in years. Never been on one of these "4D" rides, but I really enjoyed it. The "host" was funny and didn't break character, and the actually effects were really interesting with a few surprises. I don't know if these always have the same program, but it'd be cool if they could switch up the routes/effects/something to not make it appear as a one-and-done. I never got to ride this ride's twin at SFGAm, so of course we had to ride it on the second deck. Was cool to be elevated like that on a carousel. The ride was running a dreadfully slow and short program but I don't think most kids would notice. Loved the Orbit at SFGAm, and was under the impression that CGA removed this ride (maybe because I believe SFGAm took out theirs). Was a very short cycle, got to fully inverted and then came back down, but very fun and the most dizzying experience of the day. Also never been on any of these "Disco" rides, and I actually really enjoyed it. It was odd to feel the spinning motion while facing outwards on the motorcycle-esque seats. Definitely a good (and popular) family ride. Didn't ride anything else but I would like to try the Berserker next time I visit, hopefully next summer. May upload some pictures at some point, but I didn't get any very good shots. Hope you all enjoyed! I'm floating the idea of driving back up to NorCal in about a month to visit this park and check out Haunt. I see this park typically charges for Haunt admission, but free Haunt admission is listed as a perk for 2019 Gold and Platinum Pass holders. Does this include Platinum Passes from other parks, or is this a perk solely offered for passes bought through CGA? I bought my Platinum Pass at KBF. Thanks! Platinum is Platinum and works for CGA Haunt just like a Gold Pass would. I think KBF is the only CF park to charge a separate Haunt admission even for passholders. ^^ great report ironwolfman! I missed out on flight deck due to my size and Railblazer wasn't open yet, but I did find it to be a great park. It will be exciting to see what the future holds.